Sign up today for this great opportunity for you to learn some new techniques with a new medium: Yupo paper! 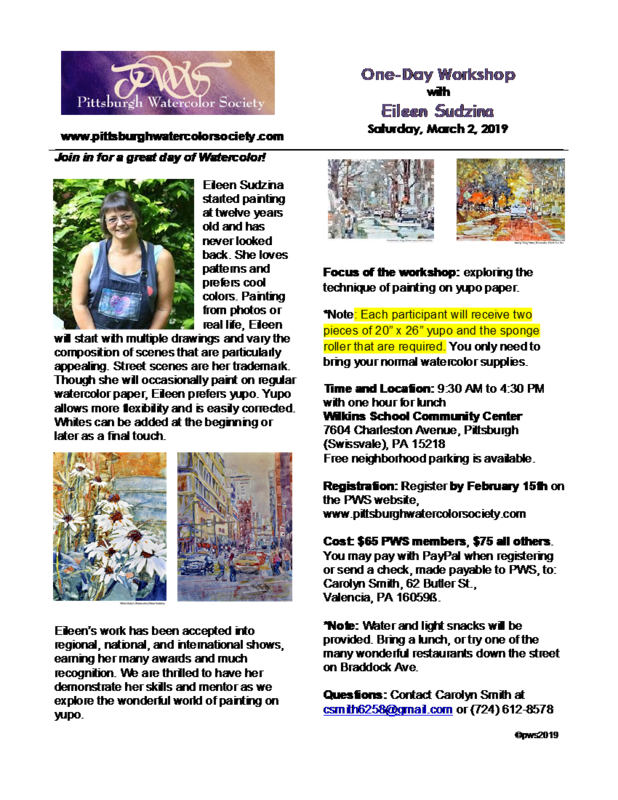 We are offering a one-day workshop with PWS member, instructor, multiple award winner and incredible nationally known artist, Eileen Sudzina. Register now, as this workshop will fill up fast! You may pay with PayPal when registering or mail a check (payable to the Pittsburgh Watercolor Society) to Carolyn Smith, 62 Butler St., Valencia, PA 16059. *Note: Water and light snacks will be provided. Bring a lunch, or try one of the many wonderful restaurants down the street on Braddock Avenue.